Given the popular status of the sphinx, it is unsurprising that the symbol was an omnipresent feature of the Egyptian Sale at McTear’s on Friday 12 October. A mythological being with the body of a lion and the head of a human, the sphinx is a central figure in Egyptian art. Of course, a huge example – the Great Sphinx – famously rests beside the pyramids in Giza, dating from the reign of King Khafre (c. 2575 – c. 2465 BCE). Although certainly not on quite the same scale as the Great Sphinx of Giza, the figure of the sphinx was visible in a number of lovely lots which performed well in the Egyptian Sale, with sphinx inspired jewellery, desk weights, clocks, inkstands and wall panels, to name just a few. 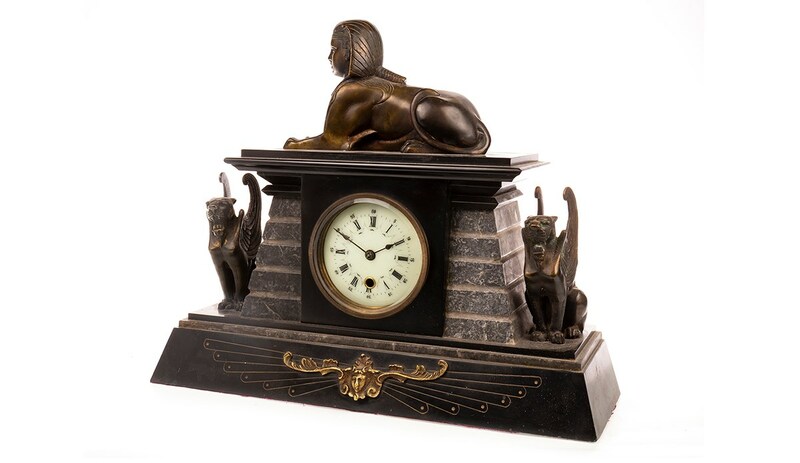 Egyptian Revival timepieces were a popular feature of the auction, and a late Victorian mantel clock (lot 1840) was one piece with showcased the sphinx, with a splendid bronzed example mounted upon the black slate case. In addition to the sphinx surmount, the handsome clock featured fluted tapering columns and outset chimera below, on a tapering Isis inspired base. The perfect addition to the mantelpiece of any Egyptian enthusiast, this handsome clock achieved a hammer price of £280. Another Victorian example (lot 1839) performed similarly well when it went under the hammer on Friday. 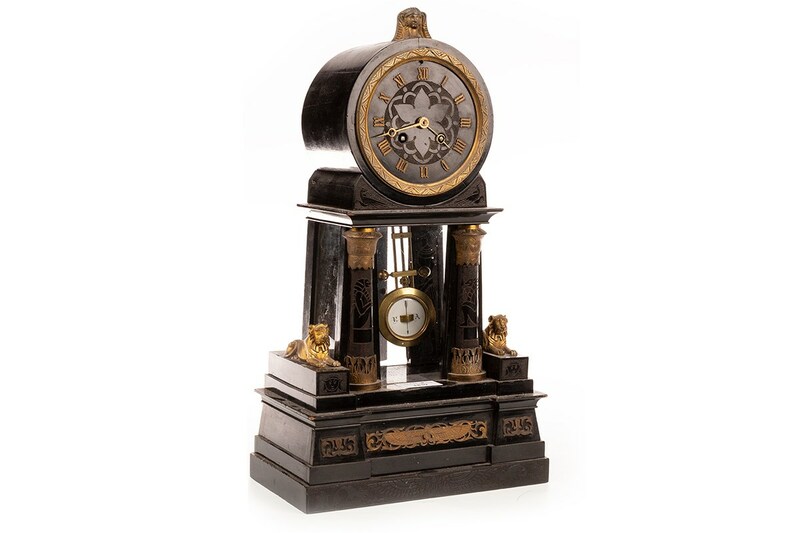 This charming clock, complete with stylised columns and small gilt sphinx style cats, reached a hammer price of £260. Egyptian Revival wall panels also proved popular on Friday. 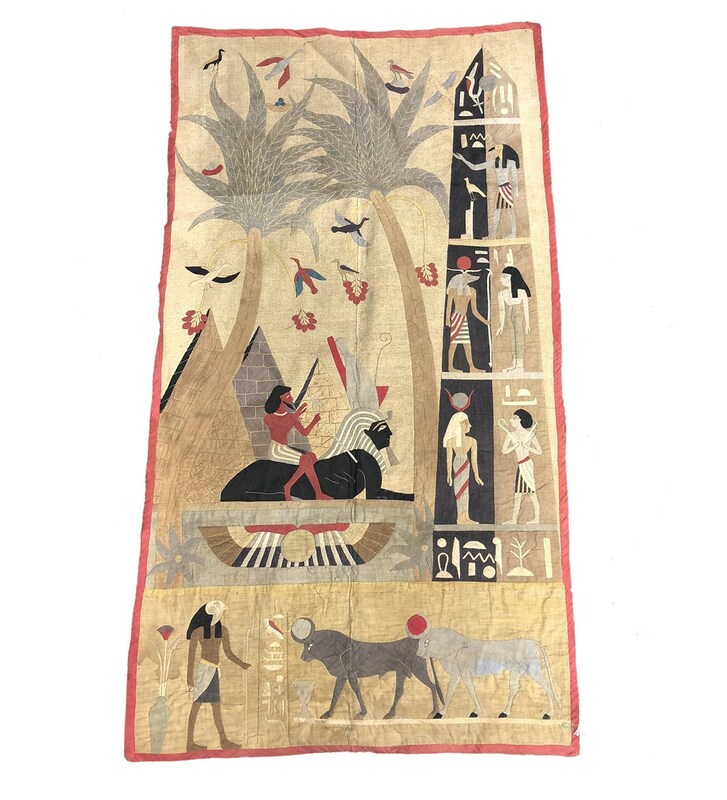 One impressive applique upright wall panel, featuring at lot 1906, depicted an Ancient Egyptian scene with traditional Egyptian motifs including pyramids and of course, a sphinx, amidst animals, figures and foliage. This wonderful wall panel sold for a hammer price of £100. The Works of Art, Medals, Militaria & Furniture Auction takes places every six weeks. Entries are invited for the next auction, taking place on 23 November. Come along to the Valuation Days at McTear’s on Tuesday, Wednesday and Thursday this week for complimentary auction advice.